Gorgeous watch! Perfect! Excellent condition! Bought this for daughters birthday and she was delighted with it. Looks impressive in real life and is larger than you think from the photo. The service is fabulous and the watch is an amazing one. Collection was an easy process, and I was constantly communicated through every step of the process from placing the order to delivery and collection. Would highly recommend. Hello Iam very happy with my watch and even more happier with the price I have paid. The customer service was dreat and I picked it up from the gold smith shop the stuff there ware fantastic. Thank you. I purchased this watch a gift for my wife for our 1st wedding anniversary. She loves it. So much so she now going to order another 1 in a different color. Beautiful watch, very eye catching and solid, very pleased with hit. i have to stay that this was the best purchase of my life, the genuine website sells the best watches for SO CHEAP! I ordered this watch and received it next day and its beautiful for those who love class! I love the watch and it was at a perfect price. Absolutely beautiful watch! Bought it on a whim, looks even better in person. A stunning gold colour with silver detailing around the dial and inside. The fit is very good, with the dial a good size. Not too large or small. Exceeded expectations, would definitely recommend for you or the glam girl in your life! Lovely watch, gift wrapped perfectly and quick delivery! Perfect watch at a great price with super fast delivery. Excellent! Absolutely stunning.bought for my sister and shes very happy with the watch. Beautiful ripe gold watch. Has a classy and elegant look once displayed on the wrist, and compliments just about any garment. Signature diamonds replace the clock numbers which give the watch a unique look. They are also displayed around the face of the watch which also give the watch a expensive appearance. 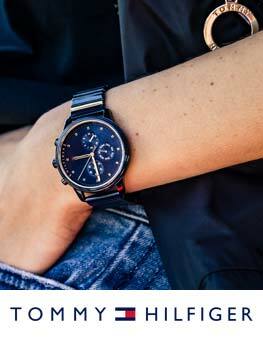 The face of the watch is heavy and the strap weighs slightly less in order to not give your wrist an ache. Personally I think it would have been better if the strap was slightly heavier to give it a more deer effect. Fantastic shop .Very fast very easy . Definetly Will be coming back. Wifes birthday. It is a good looking watch and of good quality. She is very happy with it and received lots of admiration from others. Easy to order and came when stated, good communication, would recommend to others. Great product, good price, fast delivery ! Professionalism! Excellent service and watch. I placed my order on Sunday morning it arrived the following day now that is what I call service will be using you again when looking for a new watch. Absolutely love it! the gold matches the gold chain of one of my MK handbags perfect!........not to blingy, just right, very happy and half the price from other high street shops! Amazing product, excellent delivery, high quality service for a great price! I love my watch, its my best purchase this month! Bought this for my daughters birthday.Lovely watch can feel the quality . She loved it and the bracelet adjustment service at Goldsmiths was first class. I found the watch really nice and elegant. I knew that my girlfriend will instantly will fall in love with the watch which she did. The watch was boxed nicely to watch i expected. The size of the watch was abit big for her but it was no problem we went and got the links removed for her wrist size. Overall the watch was brilliant and I was really happy with it. Thank you for everything. Very nice looking watch. It has all the bling but is not too fancy or over the top. Its comfortable to wear and a near perfect fit out of the box. All in all an excellent timepiece. I purchased the watch as a gift for my daughter. 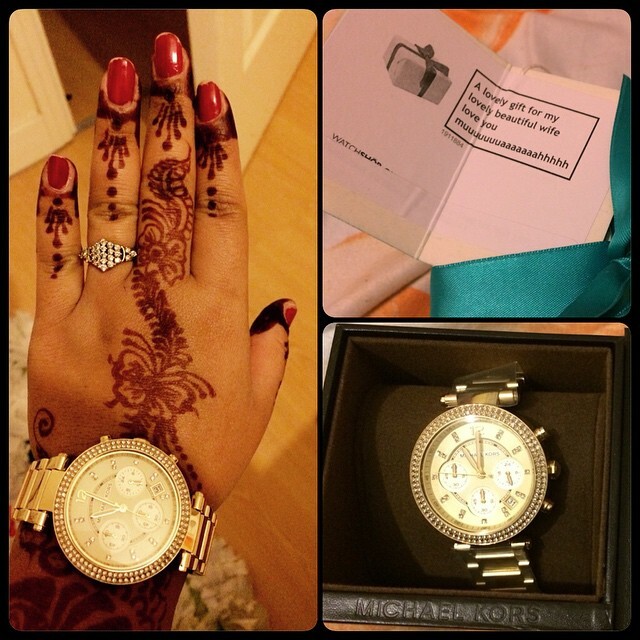 The customer service was brilliant and she is delighted with watch. I really liked the service. Watch was perfect as described. Also the delivery information was great. They kept me updated about the delivery details. I brought my wife this beautiful watch to celebrate the birth of our little baby girl. She was over the moon and couldnt stop looking at it for the first 24hours. Looks gorgeous on her wrist and goes with any other jewelry or outfits she wears. Perfect watch for a perfect wife, to celebrate a perfect moment in life!!! Very fast delivery and a fantastic service. Very nice watch. Arrived three days after ordering at lunch time. Comes in a nice box. Would highly recommend. Lovely watch, large dial you need to wear slightly higher on the wrist so as not to dig into hand or wear inside wrist. Dont let the size out you off as it is a really nice watch. Fantastic service, very prompt delivery. Will use again. Lovely piece if jewellery, smart and elegant too! Excellent service from the watch shop as usual. Delighted with this watch, excellent quality and very stylish. Beautiful diamanté detail, not too much but enough to have a bit of bling! 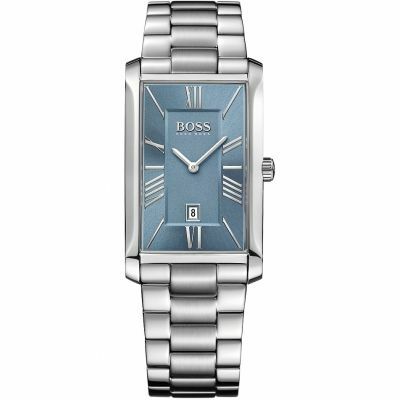 Stunning watch, perfect present for a loved one. Face catches the light and glistens really stands out. At first I thought the watch wouldnt be as beautiful as the picture showed, but when I recieved the watch I was over the moon as the watch was perfect. The diamonds where perfect, the colour was perfect everything about the watch was perfect. The watch had this magical shine on it, this catched peoples eyes as compliments started to roll in. The inside of the watch was beautiful too as it had diamonds in the inside along with on the outside of the watch, everything was so shiny which made me love the watch even more. I am happy to say that this watch is the definition of perfect. received the watch as expected looks great am pleased with it but will have to take to jewellers in liverpool after xmas to get links taken out as strap is far too big unsure what the charge will be for alteration?. 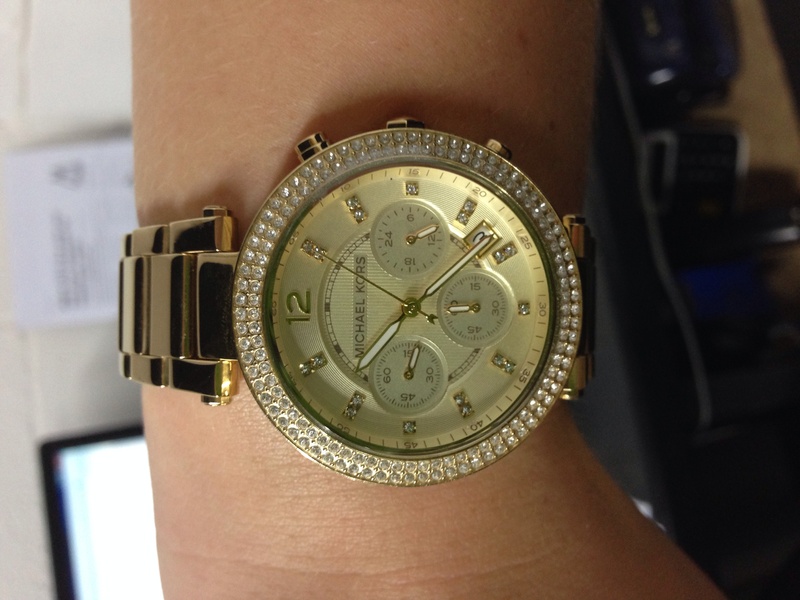 I purchased a Michael Kors watch from Watch Shop and I have to say I was very impressed with the swift delivery and the e-mail trail they sent detailing every step of the delivery, would definitely order from them again, and recommend to others. I must say that I am extremely happy with this watch which I bought my partner for her birthday. It was nicely boxed with the tags and plastic. The round case with clear stones on the around the bezel is a notice-me style that sparkles. The light champagne dial with opaline outer finish and a textured center is equally as stunning. The colour of the watch has a PVD Gold plated finish which contrasts nicely with the crystal stones. My partner loves this watch so overall it is a great product and an excellent buy! I would certainly recommend this watch, as it really is stunning and stands out on your wrist. If you are considering to purchase this watch then I would say go for it as you will not be disappointed. The Watchshop delivery service is brilliant and very efficient as I recieved it within 2 days of purchase. The customer service is so helpful, so dont hestitate to trust their services. This watch was a present from my husband to me and i absoutely loved it as it was even better than what it had looked online in pictures. The watchshop website is just amazing to order from and the click and collect at goldsmith store was an excellent choice for me as their customer service is very very good. Amazing! My Girlfriend Loved It! Thank You! Excellent time keeper. Looks fantastic and very comfortable to wear. Highly recommend to others and have had lots of lovely comments from friends. I purchased this from my daughters birthday, she absolutely loves it, she said the real thing is far better than the photograph. And the quality and finished are brilliant! When I went to hold smith to collect my item I wasnt surprised because it was in a bag but I did like the look of the watch it was lovely, really nice to wear the watch. 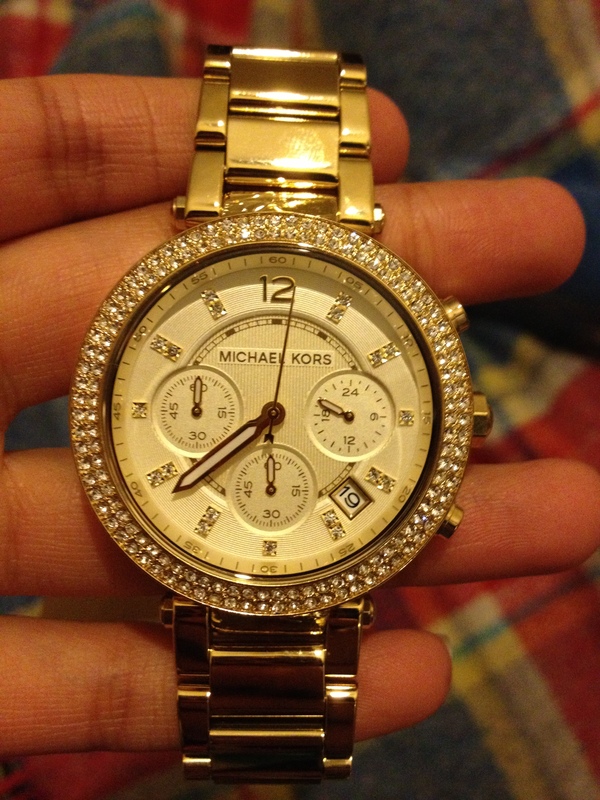 This Michael Kors watch is beautiful, Ive recently purchased it and I love it. The watch is for my daughters 21st birthday. It is just what she was after. Plus it was £60.00 less than in the shops so happy days. very happy - I gave it to my daughter as a present and she was very pleased with it. Delivery was impressive I ordered 3pm and it arrived before 9 next morning so good job. Very quick delivery, love love love my watch! I bought this watch for my wife for her birthday. I was a bit worried that even though she always liked MK watches, she has very small wrists and I thought the large watch might not have looked right on her. No need to worry!! The watch looked beautiful on her and she has been complimented on it so many times in such a short time. She loves it!! Yes the watches are slightly on the expensive side but in this case you get what you pay for. I would recommend them to anyone. 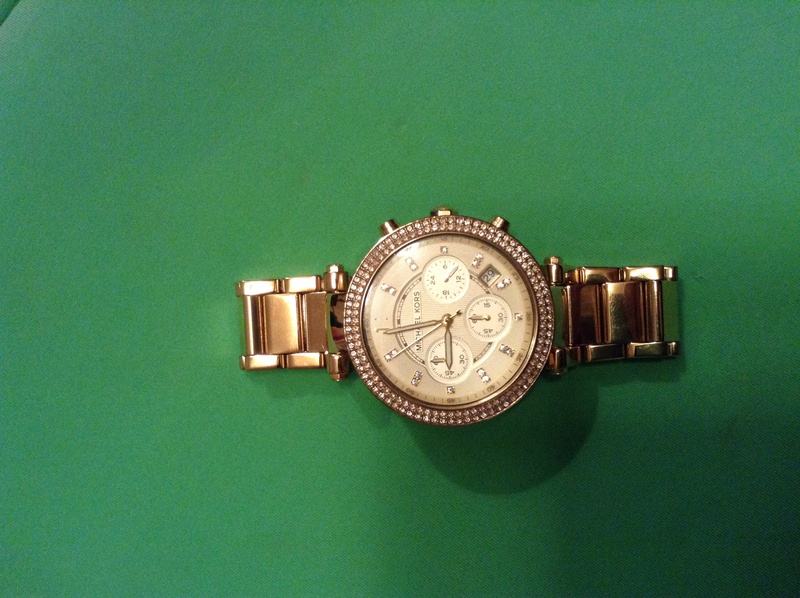 A bunch of my friends and I all put their money together and baught this watch for my friend she was so happy with it, she is petit so it did have to get altered but that was only afew pounds! brought this watch for my wife on Valentines day and it was absolutely stunning all gift wrapped. She really liked it the style was nice and fitted beautiful. Best buy!! The service was amazing!!! Ordered it on Friday the 13th and IT came Valentines day morning. My girlfriend loved the watch! Good quality and looks amazing for all occasions! very happy with purchase - opted for click n collect. Had the strap adjusted - Excellent service! Great watch, great price, genuine and as described on the site. Bought it for my wife on Valentines day. She loves it and its the only watch she wears these days. Will definitely buy from this site again. Absolutely loved the watch until the 2 fell off on the 12 and got lodged on the compass stopping the watch from ticking and hence telling the time! Been trying to contact watchshop to get it fixed and the service has been an absolute joke! Still waiting nearly a month after it broke wasnt knocked on anything just fell off due to movement for them to even send a bag to get it fixed and are now saying because it was worn obviously it cannot be fixed or refunded! Disgusted with the service and a shame because I love the watch. Obviously get all the dodgy watches from Michael Kors or higher quality companies hence it breaking. Would not recommend buying a watch of this quality from watchshop. Or even bothering to email them as theyre useless. Lesson learnt. You may as well throw your hundreds of pounds in the bin if you would like a watch that tells the time. The watch looked exactly like it does on the internet, gorgeous. Beautiful colour and perfect size. A nice bit of bling . The face is intricate, but easy to read. Great purchase for my better half. Pretty, elegant and very very beatiful. I did buy to my mom, and she loved it. I felt very security with this brand. I hope she really enjoy it. So I brought the MK watch as a gift and overall very pleased with it and its a nice colour. Its quite heavy but that wasnt a put off. I like the service of being able to ask to take the links out which saves time. Also the price for it was great, saved lots of money whereas I brought it from the shop It would have cost slightly more. Overall very pleased with the item and service offered from WatchShop. Really good quick service and the watch is brilliant I purchased it for a gift for my wife and she love it. Quality watch for the money I paid. Great design, just like as advertised. Pleased with my purchase. I would recommend the watch to all my friends and family. The watch has a gold bracelet. The face of the watch is very pleasing to the eye with crystals set round the face. The watch looks good on and makes telling the time very easy. Lots of my friends have said how nice it looks on. Absolutely love my watch its fantastic, received excellent service and great price! Will use again. The sparkly stones add a great deal detail to it. The watch is elegant and I love the gold plated. Also it looks good for those who got small wrist like me. However one thing Im very dissapointed which I will never buy from here is they didnt stamp my warranty and thats very important in order to get your replacement. 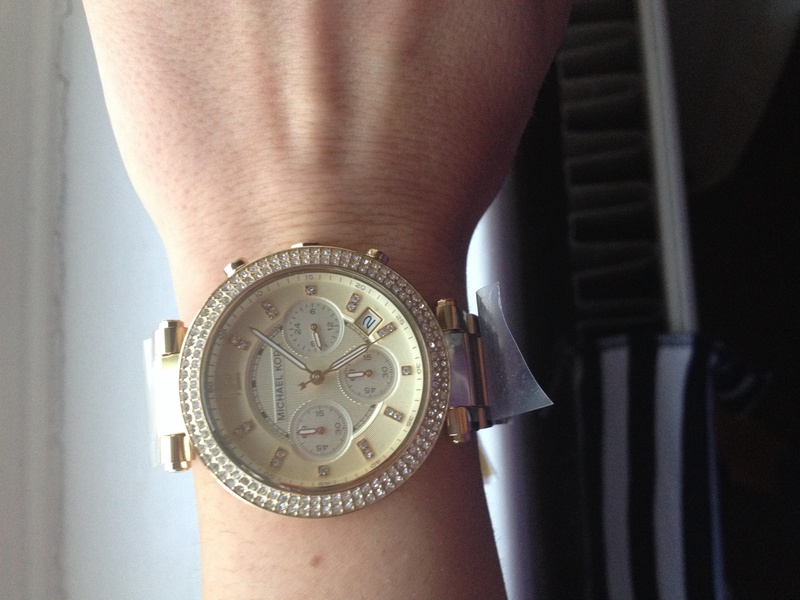 love my stunning new Michael Kors yellow gold watch.love the size of the face & the way it sparkles, very stylish, cant wait to show it off, just needed 2 links took off, which my local Jewlers only took £4.50 for doing so, now it fits me lovely, I have had loads of compliments about my watch, my niece loved it so much, she asked me if could order her one in the silver, which she will pay for lol, she loves hers also. both watches were delivered promptly and in lovely brown leather boxes, niece took her to a beaver brooks, under the impression they took the links off for nothing, ended up costing her £10 plus fares there & back, maybe best getting watch shop to do it for you, if want it done & know how much you want off, all in all, very happy with my purchase & would highly recommend watch shop. com. would dearly love to win the £200 for doing the review, as I would put it towards the cost of a watch that my other half has his eye on for his birthday coming up lol. Fantastic watch, the watch face itself is the perfect size not too big nor too small. The diamanté s around the watch make it look really girly and pretty, perfect for day and night wear. The only bad thing about the watch is that the strap is too big but I took some links out and now its perfect! Overall the watch was absolutely stunning and for the price I couldnt of found a better watch. My favourite thing about the watch is all the carefully fitted diamonds around the edge of the face. I cant write anything about the watch that I dislike as it was perfect. At first when my girlfriend asked for the watch to be in gold I wasnt to sure as gold doesnt usually look that great but I will be honest it couldnt of looked any better than it did. If I were looking at someone and they were thinking about purchasing this watch I would 100% persuade them to pick this over any other watch purely because the style is amazing and the colour was perfect. Also even the outer box was nice, with Michael Kors wrote onto it. My final part, I will be HONEST and say I would definitely purchase another watch like this if needed. Was great. Bought as a Xmas gift for my girlfriend and I didnt get it wrong. Totally over the moon with the watch , looks and fits after link removal perfect. Ill definitely be buying from Watchshop again as I want to get her a nice collection of these watches. The quality is awesome and the service through the Click n Collect is second to none. Many thanks Watch shop, all smiles at this end. I purchased this as a gift for my wife and she was absolutely delighted. It was packaged beautifully and was perfect in every way. 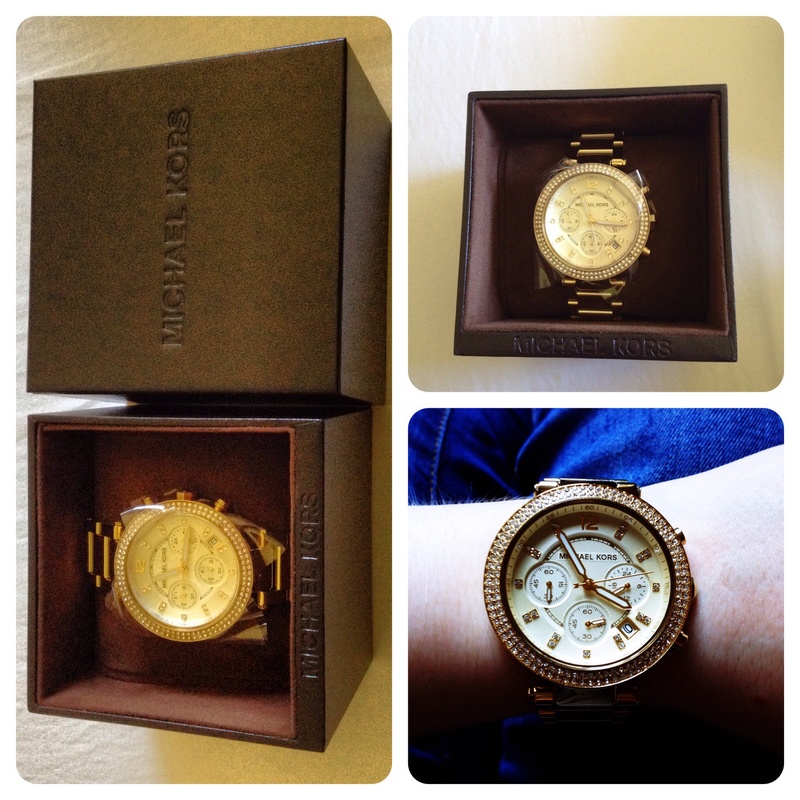 My wife was so excited to be the proud owner of this gorgeous Michael Kors watch which she had dreamt about for so long. Purchased watch is exactly whats web showing. Accurate in 100 % I bought this watch as a gift. My partner is really happy. Beautiful design and really quality build and feel to the watch. I brought as a xmas present for the girlfriend and she was over the moon with it. 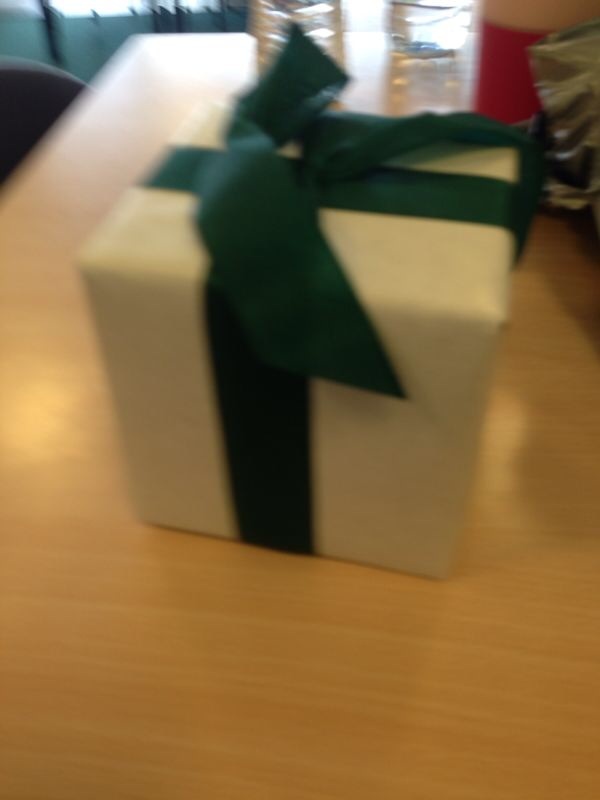 Also had it gifted wrapped which made it look lovely and saved me a job. If u are looking for style and top quality then this is a must buy!! Great watch and wife is very pleased with it. I would recommend this watch and the service to anyone. This watch is absolutely stunning! Looks very stylish, sophisticated and expensive. The style is very modern and with it! and the gold colour is very authentic and not over the top glitzy! It is very well made and is well worth every penny....my daughter who is 21 is over the moon with this watch...and Watchshop are second to none with customer service, delivery and most important the price! Much cheaper than high street stores. Good quality product. Bought this for my girlfriend as part of her Christmas and she was very happy with the product. The colour compliments most clothing she wears as opposed to the rose gold version of the watch. Diamonds around the outside of the watch make it look very fashionable and glamorous. Overall I would rate my experience and the product with The Watch Shop at 100%. I bought it for my girl friend as a christmas gift and she loved it. A great deal which came with a two year warranty. I would recommend it as a great christmas gift. Came in a gift wrap which I found extremely helpful as I do not have the patient to wrap gifts. This is a great looking watch, which I bought as a birthday gift, and it was very well received! The only downside was adjusting the clock, whic was tricky to say the least. There were three knobs on the side but two of them seemed there for show. Also we were a little hesistant to pull the central adjuster out too much in case we broke it. We managed to figure it put in the end though! Apart from that, this is a beautiful looking watch and I would highly recommend it to others! I was so impressed with it im looking to buy one for myself in silver or rose! Very good service and cheapest price I could find. I ordered it to be picked up at shop Goldsmiths and was emailed when it was ready.Goldsmiths suggested I check the order to make sure it was right and then they gift wrapped it for me to!! 5 month ago I visit the watch store with friend and I really love this watch but the price was I think £229 which is quite expensive for me so I didnt bought. Before I got my order I was bit afraid but when I get I Im so happy because the watch is mk original with nice packing with 2 years warranty. Great price, Bought as a present for my daughter, arrived on time. Sure she will love it. Bought as a gift, came in a nice box, Watch looks great, time will tell if its been a good buy, if it stays ticking it will be good, if not I will let you know. I purchased this as an anniversary present for my wife and was a little concerned at first by the weight of the package when it arrived. Most of that was down to the solid box although the watch itself is still very solid and somewhat large for a lady in my opinion. My wife is delighted with it so all is well. One facility that would be nice is if you could offer a service to remove links in the bracelet prior to despatch so that it could be worn straight away. Im 21yrs old! Therefore trust me I will write whats up with this watch and I would never buy something that wasnt in style! This is my first ever watch, its been a long time coming but only because I knew I would save up to buy one really nice watch rather than lots of different ones! It came with a really nice form leather box. 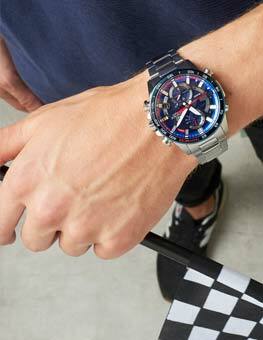 I couldnt decide whether to by this one or the Darci one everyone has the classic Blair chronograph one which is fine but I wanted mine to be different and stand out! I decided on the Parker because firstly, the bracelet part is actually more feminine compared with other watches like Darci which have a very wide manly type of bracelets this one is simple and its appropriate to wear to Uni and on an occasion as compared with watches like Darci which are slightly more plain and have a wider dial which I think will only be possible to wear on formal occasions and it also gives a slightly mature look! This one however is gold and it has a good/ modest amount of small crystals around the dial as well as dials and minimal crystals inside the dial as well! It makes it look more interesting, more fuller and more going on whilst still classy and simple due to the round champagne dial. My wrist is really small as in I havent seen many people my age with a smaller wrist and I bought this, it was slightly intimidating before taking links out but after I did I wrapped around my wrist perfectly and it just sat well! It gives the date as well. Stunning watch, looks very classy and expensive. Excellent service from watch shop. Super fast delivery and excellent communication throughout. Highly recommend both the watch and the service from watch shop. 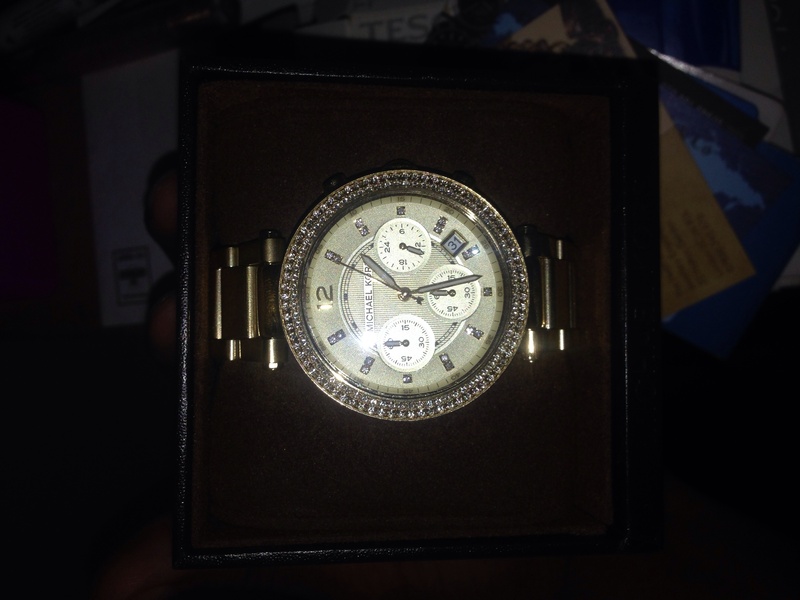 bought this watch for my girlfriend she loves it great watch ! Also it is great value for the price of it great buy! Looks great, should be a good Christmas gift. Saved a load of the shop price. Delivery was fast as well. Amazing. Purchased on a Friday email conformation of purchase dispatch and progress keeping me up to date with the process, received on sat morning and that was standard delivery. Highly recommend. Very pleased with this product. The style is very modern, fashionable and simple yet elegant. The crystal surrounding the face really gives the watch that extra love factor. 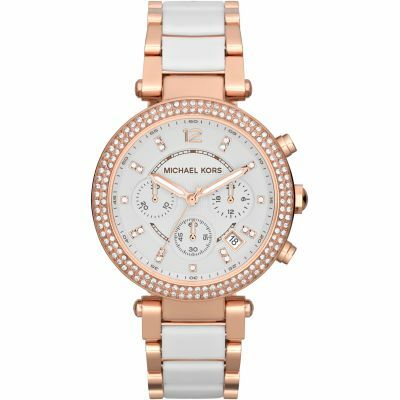 I personally have a different style Michael Kors watch, however I really prefer this one and Im even considering purchasing the item for myself aswell as a gift. The watch comes in a hard protective box with cellophane to protect each link and also the face. Definitely worth the money and I was really pleased with the product. Excellent watch, made very good Christmas present! Recipient was really pleased. WOW fantastic looking watch, purchased for my daughters Christmas present, wrist band was to large so took to Goldsmiths and had links removed free. Very pleased with the watch I bought my girlfriend. She absolutely loves it! Great price also. Cannot fault it at all! I love the gold colour, champagne dial, studded numbers on the dial, just enough sparkle. They are quite big, but that is exactly what I wanted. Lovely had a sneaky look before it was wrapped : but was a but loose so needs to be takes to the jewellers so I can have some links out. Cant wait to wear it though! All I can say is that this watch is absolutely stunning! The delivery was on point and I loved how I got email updates regularly. The watch itself, really pretty and not too flashy but still catches your eye. 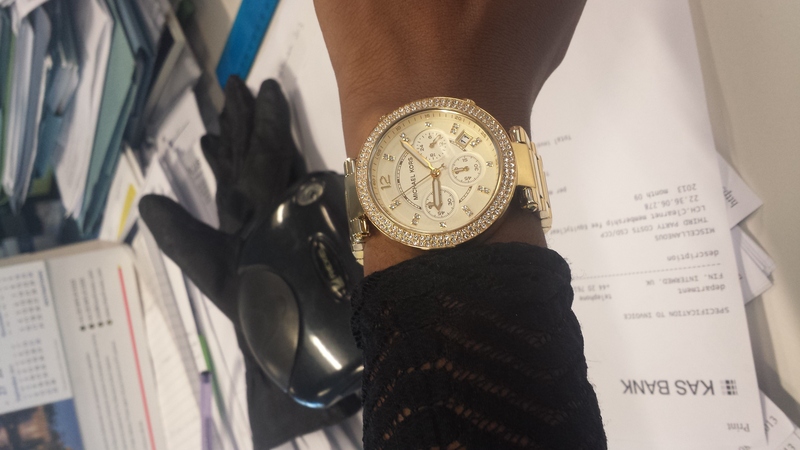 Personally I love the little diamonds around the face of the watch thats what makes it a bit girly. Looks fantastic, big classy dial. I recently bought this watch, and I am in love. This watch is so beautiful and at first I sure whether to buy this one or the rose gold one. I am so glad I chose this one because it looks so nice on and you can wear it for an evening out and in the daytime as well, also the colour matches everything. I really like these type of watches because they look very classy on! I was so excited to get this and at such a great price too! The delivery was really quick and all I had to do was take it into a goldsmiths and they adjusted it for me and even set the date and time. I am satisfied with my product and will definitely be shopping at watch shop again. I bought this watch as a Christmas gift for my girlfriend and I could not be happier with it. Its absolutely stunning, beautiful watch. I really like the size and weight, its not too big and chunky and a comfortable weight on the wrist. Looking for one everywhere for my girlfriend an finally found this one. Cant fault anything, the packaging, the fast service, its all great. The colour was, in my opinion, as seen in the photo supplied. The gems set this watch off I say. 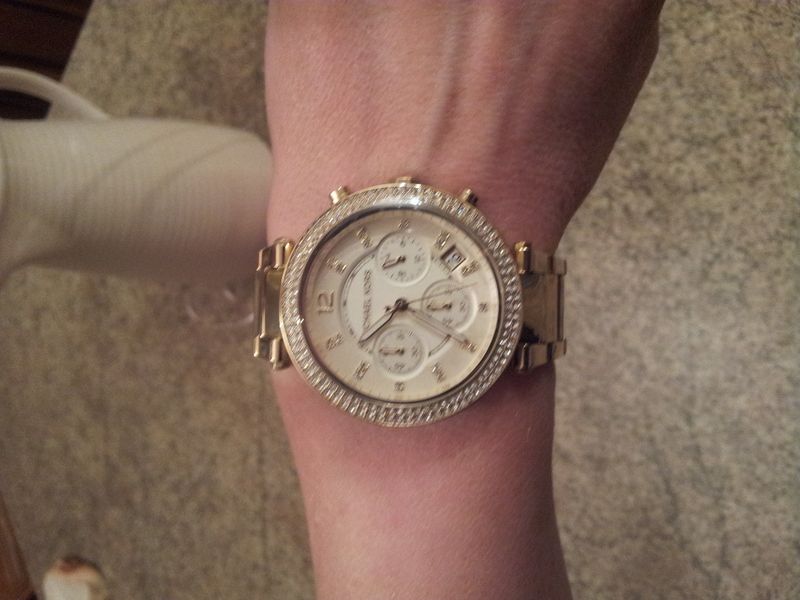 Its a rather weighty or sizey watch for a girl, but they know what they like I suppose! If you like the photo and have an idea of the weight or feel, you wont go wrong with this watch, especially for the price. This was a gift for my daughter who is 22 and she is very pleased with it. We had the strap altered and it fits perfect now. Looks very expensive, all in all lovely watch! Had already purchased this item with another shop. Then saw watchshops price which was £70 cheaper, so returned the other watch. Was slightly worried may not be the same watch but it was. Very pleased with notifications when ready to collect and also easy to collect from a local Goldsmiths shop. Cheapest price compared to the other shops that sell this watch! Great price, smooth payment, fast delivery and amazing product! Great present for my daughters birthday. Would recommend! Wanted a gold strap watch with ith a difference. The pic on website does not do it justice. 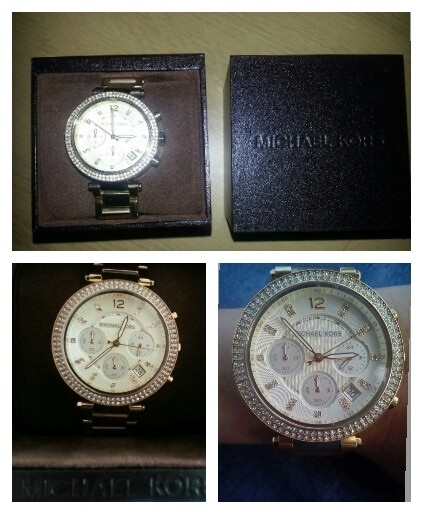 Goes with any outfit and for an affordable price its MK. Loved the top rate service and communication of watchshop. Will be ordering for Xmas and again for my self. Thanks watchshop. The watch is excellent. As it was gift for my wife, she loves it very much, Colour is fantastic, features and everything are really really good, i would highly recommend this watch. Also suggest to other customers to buy it from the watchshop. I am very much happy with this product as wife is happy. I am highly happy with product i bought and with service as well. I was looking online to find a classy looking watch when I stumbled across this watch! I decided to buy it because it looked so beautiful in the picture! I had very fast delivery and it arrived the following day! It comes in a very cute little Michael kors box, but for me the box is actually very heavy! So I thought if I wore the watch it would be heavy too, but to my surprise when I put it on it was very very lightweight and you cant even feel it on your wrist! The colour is lovely, its just a typical gold colour and it has delicate Swarovski crystals placed all around the watch, which literally glitter and sparkle in whatever lighting your in! The instructions on how to set up your watch were very straight forward, it comes with a little Michael kors booklet that is very easy to read and follow! The only problem with this watch was that it was far too big for my wrists! I have very small wrists and find it very difficult to buy things that actually fit them, however I got it adjusted and it now fits perfectly! In the picture the size of the watch looks really big and chunky but once you have it on it doesnt look that big at all! Its a statement peice and I am very happy that I bought it because Ive had so many compliments fr random people on it, men and women! I love the whole look of this watch, its very feminine and very classy! If anyone is looking to buy something for their girlfriends/wife/daughters then I would highly advice that you buy this! 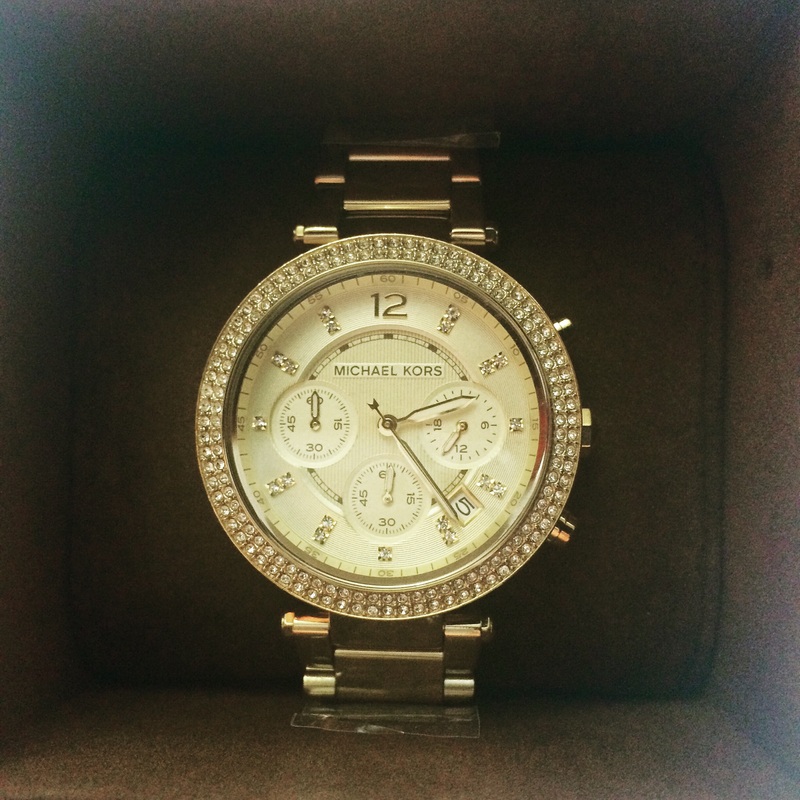 They will actually love you forever for buying them this very beautiful watch! 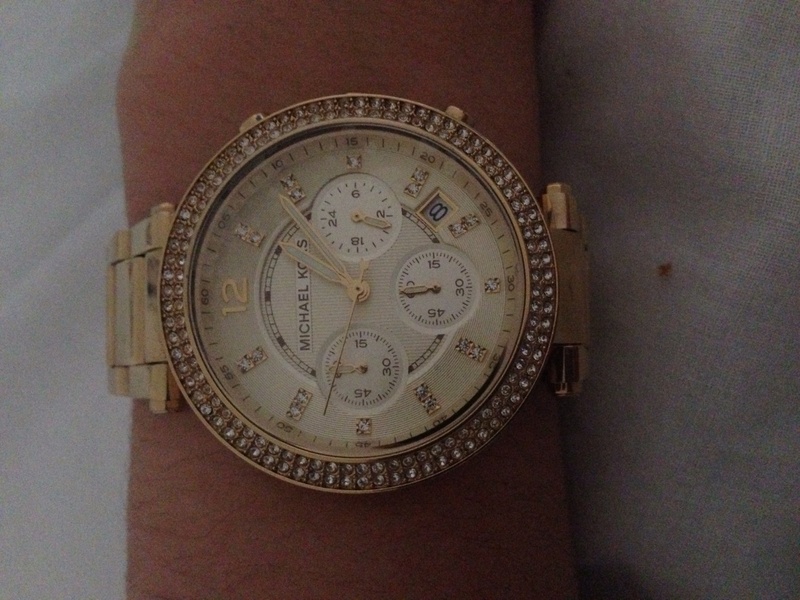 I love it so much and will definetly be buying more MK watches in the future! Very good product, exactly what the fiancee wanted! Great and quick service from yourselves and very good price in comparison. We received this watch its very nice, but a bit to big we had to take it to get made smaller other wise no problems. The watch arrived promptly and in pristine condition. The watch has a very noticeable face, outlined beautifully by the gems along the rim. The face is large so the time can be read at a slight glance and i was particularly pleased with how it shows the day of the month ie:1/2/3/4/5... The colour and finish of the watch is simply delightful the golden tone giving a strong implication of the value, accompanied by how it shines, its simply stunning and i would definitely recommend this watch to anyone who is sitting on the fence to buy it! The only bad thing about it was that i had to have some links removed to have it fit my wrist, but my wrists are pretty small, and it wasnt any trouble to have 2 links taken out. Amazing watch, my best buy this year. Rich gold Colour, the detail of the diamontes is so elegant, this watch makes your outfit. I thought it maybe way too bulky for my arms as I have super skinny wrists like a ten year old! had to get 6 links removed but it still not too bulky sits perfectly on my wrist. If you think it will be too bulky trust me it isnt. The watch is absoloutly fantastic! 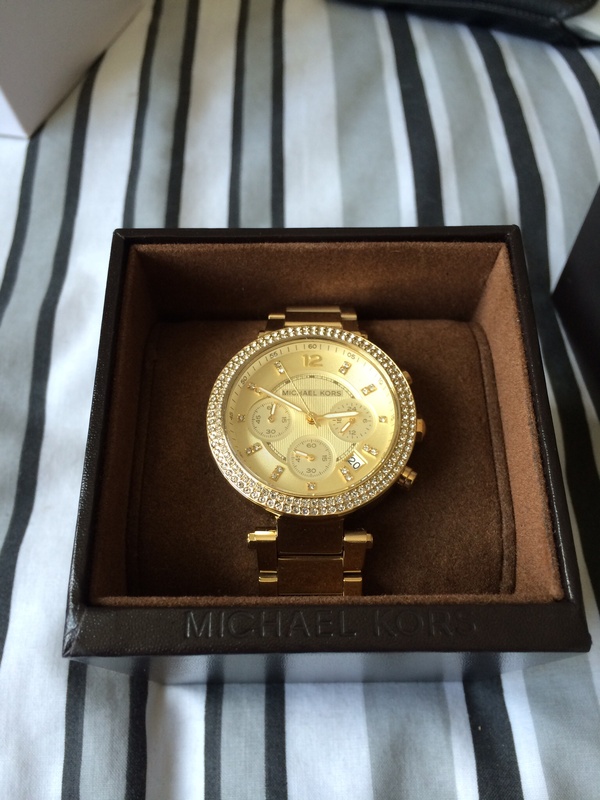 the crystals on the outside make it stand out,nice clean glass also...the micheal kors watch box is a nice touch, only thing i will say is the weight of the product is quite heavy for its size.but excluding that the size of the watch is perfect, the gold colour is just lush and was very pleased of the qaulity of the product, a very good but indeed! Absolutley stunning watch, was stuck between this one and a similar one id seen by another brand but so pleased i chose the Michael Kors now. I like a quite big face on a watch and this one is the perfect size. It has stunning dimantes round the face which give it a bling look and look brilliant with the gold bracelet. Only had the watch a week and i have been getting constant comments on how nice it is. It is slightly big on me so i do have to wear it pushed up a bit although i do have quite large wrists so other woman may need to have a link removed. I am very pleased with the product. It was a gift for my daughter and she was very happy with it and thought it was really nice and blingy. I feel the watch was worth the money which I paid and also was good quality. I went for the gold because I found the brass one looked quite cheap. The dial on the watch looks big on the website but on your wrist it looks good. I think once someone is wearing the watch it is very eye catching. The watch was a great gift for my fianceé she was blown away by it and now shes in complete love with it, it never leaves her wrist great buy and a perfect gift for a special occasion! 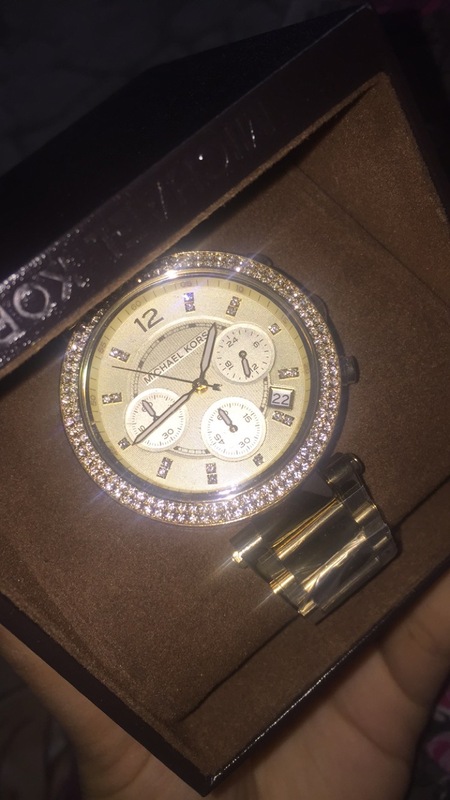 Bought the watch for my daughters 21st birthday, she absolutely loved it. She choose the watch herself as she loved the diamond setting around the outside. Very good choice as looked lovely on her once I had got 2 links removed as too large. This is a stunning watch. The gold colour is just right and will suit any skin tone but looks perfect on me. it is well complimented with the crystals around the watch and dial. The dial face colour is pretty and feminine with lots of compliments followed every time I wear it. I love this watch. This is my going somewhere nice today to wear watch or just feel like looking glamourous today to wear watch. I bought this watch for my wife for our 21st anniversary. She loved the style its features and the Colour. And now she loves me even more! Thank you very much the service was fabulous delivered on time and the correct amount of links removed after I sent in my wrist measurements. I purchased this watch as a gift for a friend. The quality of the watch and bezel is great. I initially was skeptical as the watch does appear to be quite large in the photos but when received it was perfect. If your wrist is small I would suggest requesting the alteration before hand as it was quite large. Just a really nice watch, exactly what my daughter asked for, the quality shows through and the finish is quite superb. Need I say more! My fiancé was delighted with the quality of this watch the gift wrapping wat particularly nice. The watch it self was easy it adjust the time and date ect. Over all we are very happy with it. The watch is good value for money. I bought it as my sister in law has one and its looks very fashionable. The watch arrived the next day and was very prompt. Absolutely gorgeous watch, would definitely recommend buying from WatchShop, packaging was perfect so the box and watch would not get damaged and fast delivery. 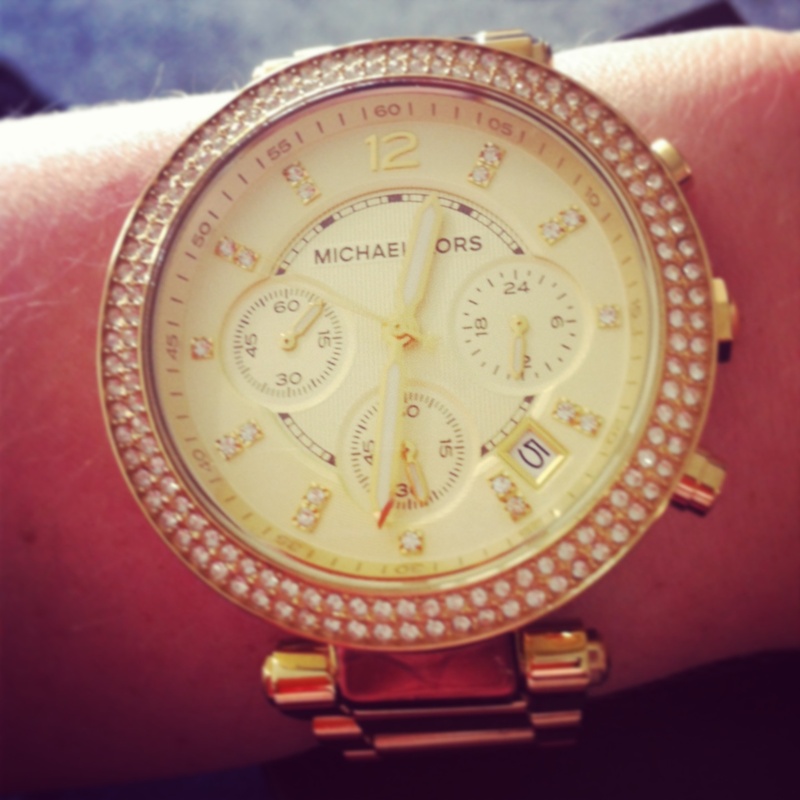 I am so in love with this watch!!! I bought it as a late birthday present to myself and Im glad I got it. It goes well with everything I wear and the bling on it attracts attention every time I wear it. I would recommend anyone looking at this watch to buy you wont make a mistake at all. It looks even better in person than on the website. Just trust me you wont regret it. 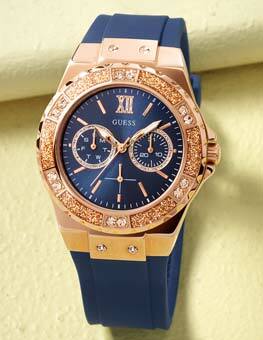 I think this watch is georgous! Was such a great buy for myself. The colour is georgous, much nicer than the photo shows. I love the diamonds all around the face and how it shines in the light. It is very blingy and looks great on a night out! I love the champagne colour face its truly stunning Ive had so many compliments. Great Watch, Looks brilliant. feels sturdy. diamontes look brilliant. really well made and covered and protected well. ordered with gift wrap and that looked awesome too! I brought this watch for a present for my mums birthday. At first I thought its a bit chunky for a ladies watch. When it arrived I was pleasantly surprised with how light it was. The value of the watch was also the best offer out there. I saved £40 on this purchase when compared to the high street. I bought this watch for my niece for her 21st birthday. 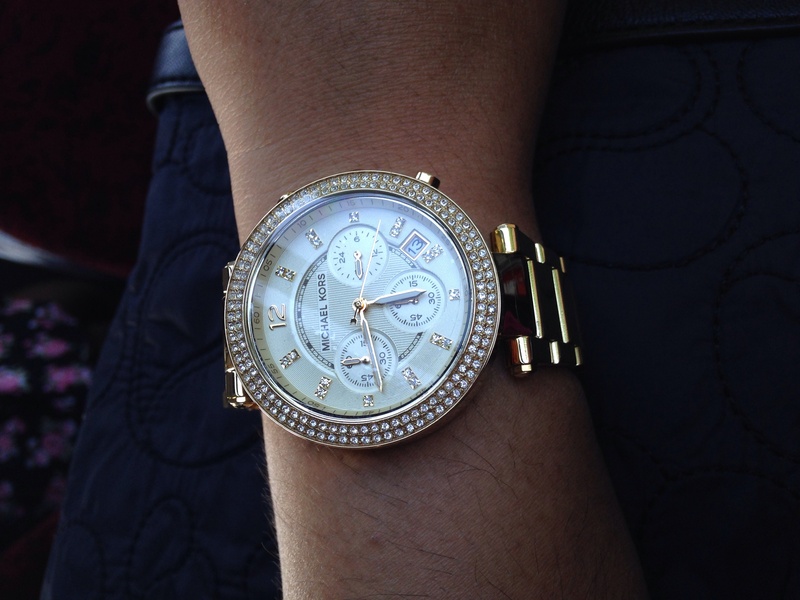 The watch is beautiful and very modern having a large face especially for a womens watch my niece chose the watch and Michael Kors watches are very popular for young people . The only disappointment was that the strap was unusually large too large to fit any womans wrist which meant it had to be altered at a jewellers another cost on top of the watch. my girlfriend loves it. love the built quality and color. only pon would be the sheer size of the watch. 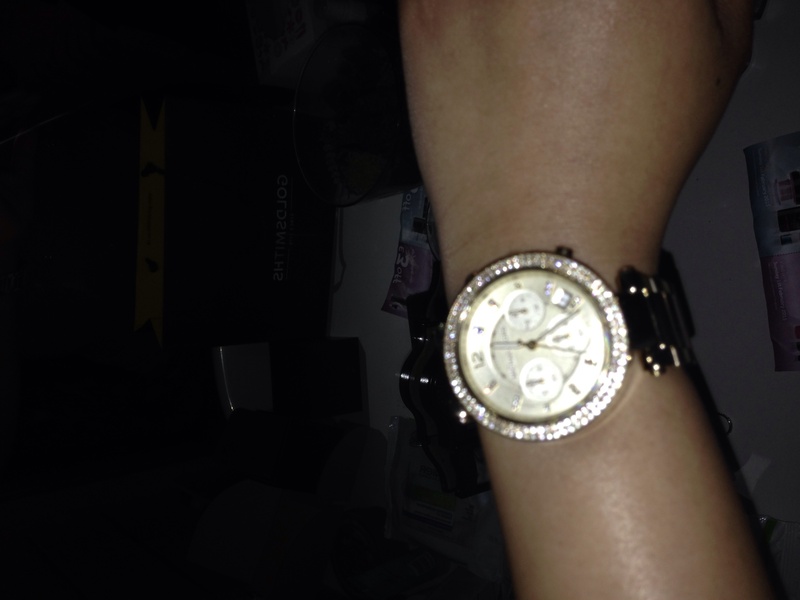 What a LOVELY watch I brought!! !,I have been looking for a watch some time now I really like the DKNY watches but I was put of by how big they looked on my very small wristed,as I was looking at some the Michael kors watches I fall in love with the MK5354 so I had a read of some if the reviews people had left and they helped me a lot....I couldnt Wait for my watch to come I had to have some links taken out.Every 1 has said how pretty classie the watch looks on ! !The delivery was Great they said the next and it come as they said..I Would recommend any body to buy from watch shop. Amazing watch, I love it! The picture doesnt do it justice, looks lovely when the light catches it. 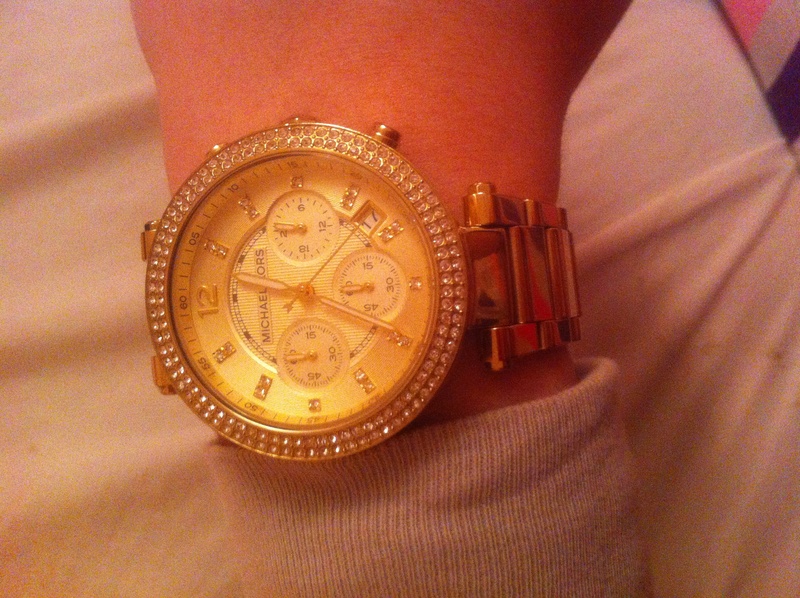 Absolutely love my Michael Kors watch. It is the first watch that I have ever owned. I never usually like them as I have extremely small wrists so I get put off by it potentially looking over the top and too large. However this watch is extremely elegant. Ive worn it every day since I have received it. Its glam enough to wear on nights out and special occasions, it is also casual enough to wear just to work. It has beautiful crystals that surround the watch face and the really catch peoples eye. Its also suitable for any age range. This is just a very beautiful watch. Changed my view on watches altogether. I had wanted a MK wrist-watch for about 6 months and got my partner to buy me one for my birthday. I had a some-what difficult time choosing between the Chronograph and Blair but finally went for the Chronograph as it is slightly different and more sparkly to other MK ladies watches. I love a bit of sparkle, I do. I am very happy with the wristwatch, although I thought the face was flatter than it actually is.The stones bit that surround the face is raised which I hadnt expected. I have to take a couple of links out to fit my wrist but I cant wait to wear it out for the first time! excellent watch well worth the money, it is very tidy and only had to have a couple of links took off. the case and packaging is very nice. will probably buy myself one when i have the money. I have always wanted a Michael Kors watch and I decided to order one from the watch shop because of the good reviews and excellent price! The watch was exactly as seen on the website, showing a true description of what you receive. Its as glamorous as the picture shows with great detail showing off every sparkle. Looks great on my wrist, perfect for me! I was so impressed with the updates of when your watch was being packed and sent. Next day delivery was great as I didnt have to wait for long at all to receive my watch. Overall I would recommend the watch shop to anyone, great fast service. With a amazing watch! In years. Its gorgeous. Needs a few links off it but thats ok. Def worth the money. 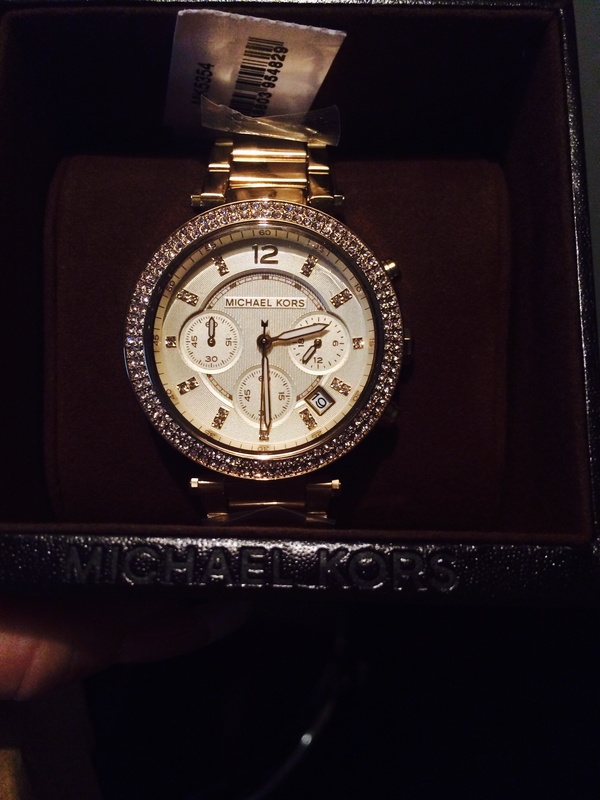 Beautiful Michael Kors watch received next day in time for Christmas. Wife absolutely loves the watch, came in the usual Michael Kors box etc. Matches an earlier bracelet I bought to a tee. Would definitely by from the Watchshop again. Great watch, service and delivery. +++++ plus!! Perfect fit after I had 4 links £4 taken out Ive a small wrist so was a little concerned watch may be too bulky but it is a beautiful piece of jewellery. Lovely gold colour with a beautiful face and links. 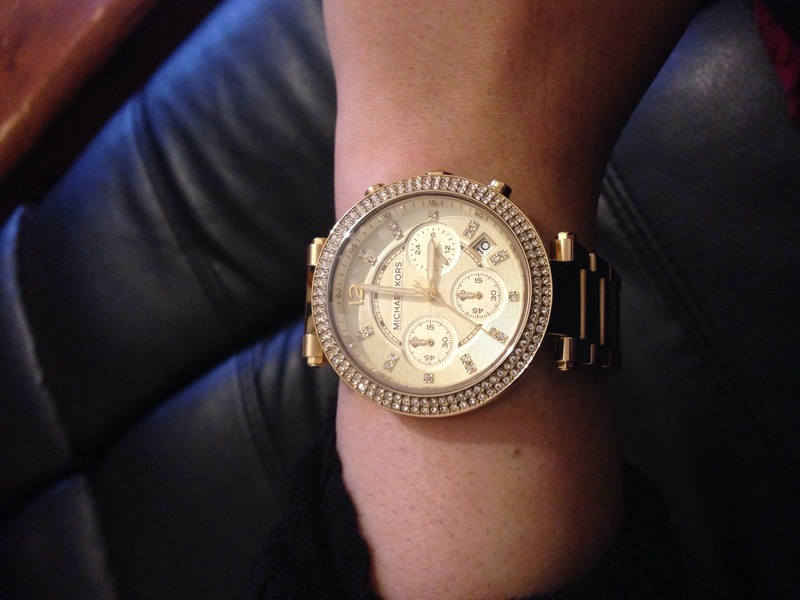 My parents recently purchased the Michael Kors watch for me as a Christmas present. 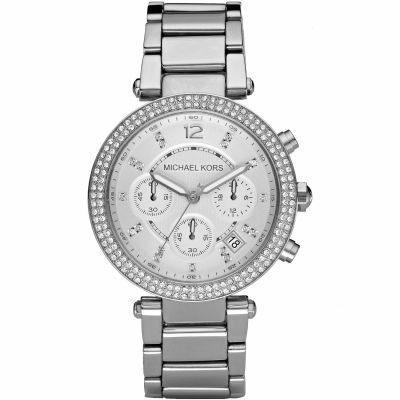 This particular model, MK5354 part of the Michael Kors collection, Model Year 2011. For me, it is the perfect balance between elegance and functionality-it turned out to be the perfect watch. Golden stainless steel bracelet strap with deployant buckle closure. Round bezel adorned with pave clear crystal insets. Numeric ring surrounds light gold face. Golden time stops with clear crystal accents. Three-hand movement. The hands glow in the dark! 100 metres water resistance Watches rated to 100 metres can be fully immersed in water, and are the recommended choice for swimming or snorkelling. They should not be used for diving. 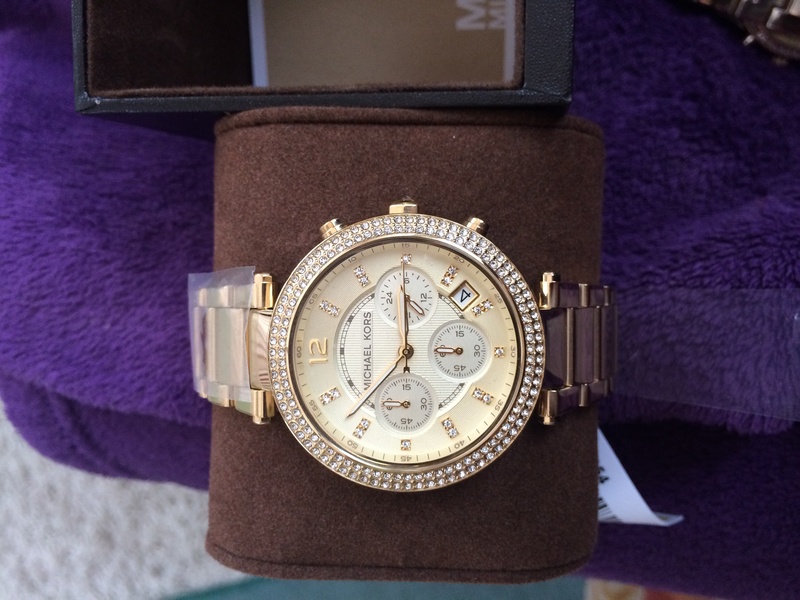 The watch came in an official beautiful Michael Kors presentation box with pillow for the watch and an official Michael Kors guarantee and instruction manual. -the general looks: it is an absolutely gorgeous watch-everything you would expect from Michael Kors, that reflects the pinnacle of luxury. 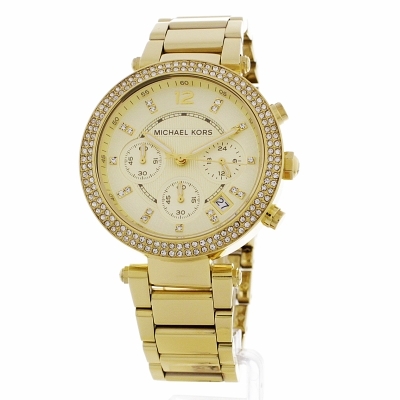 You cant go wrong with Michael Kors if you are looking for aesthetics, and this watch is gold plated with stone encrusted detail as hour markers and around the case making it look very expensive. These catch the light and look stunning. -the size of the watch face: although I have small wrists, it doesnt look too big or bulky see image for better illustration as the design is so intrinsically feminine. -the size of the strap: my small wrists meant that I would have to get the metal bracelet strap resized and I had to get 4 links taken out with cost £3.50 locally. Despite the fact that links have been taken out, you cant tell and it now fits perfectly. I also have the option of getting the links put back in if my wrist gets larger. I did have doubts originally as I am more used to leather straps but the resizing option makes it easier. 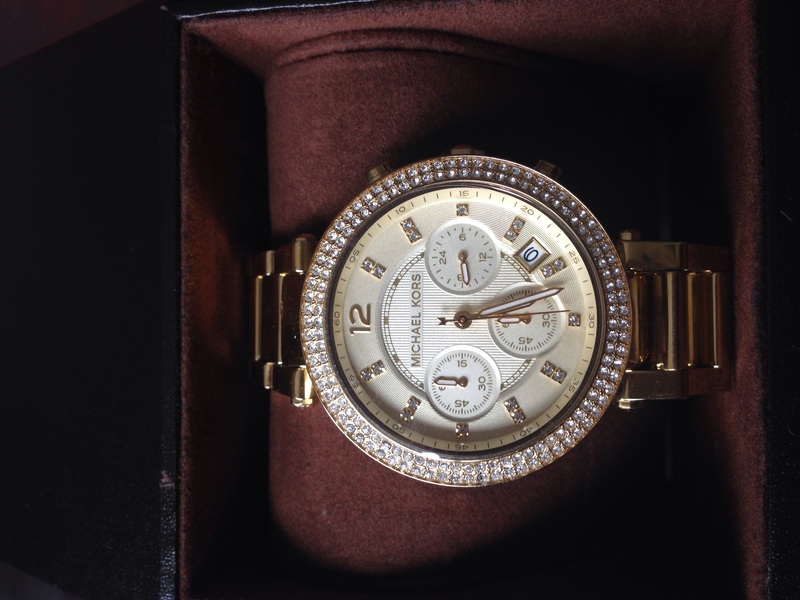 -the colour: although I was unsure about whether to go for the Classic Michael Kors rose gold or this golden colour, I think this one looks more elegant and will match with more of my clothes. The champagne colour dial looks elegant and more subtle than rose gold in my opinion. -the durability: although it seems like a delicate watch, the 100m water resistance mean I dont have to be conscious about wearing it when I am in contact with water. The PVD gold plating should be useful in preventing scratching over time. -the style: the aesthetics of the watch along with the durability mean I can wear it for everyday use but I can easily wear it to a formal occasion due to the expensive look and crystal detail. -the white part of the hour, minute and chronograph hands glow in the dark: this was a surprise for me as this feature is not detailed anywhere online about this watch. A feature Im sure will be useful at night time. -the chronograph feature is surprisingly useful. As this is my first chronograph watch, I wasnt sure how useful itd be but its very easy to time simple everyday activities e.g. Cooking and although I have a smartphone for this, sometimes its just simpler this way. If you have little use for the chronograph feature, it can serve as aesthetics. For me, a chronograph feature looks sophisticated and mature. -the date feature: as someone who needs to KNWO what the date is and always seems to forget, this feature is extremely useful. -attention to detail: you can rely on a Michael Kors watch to be fabulously detailed, with MK engraved on the back of the clasp of the bracelet and crown used to change the date and time. The numbers for minutes at 5 minute intervals are also seen within the watch, a nice extra detail. 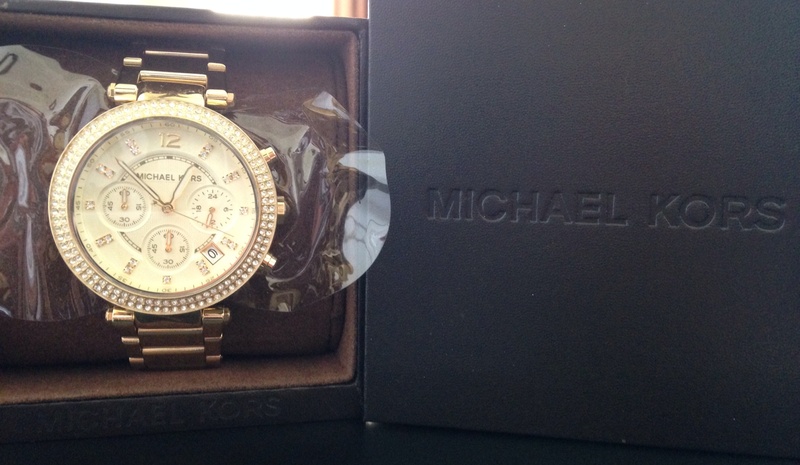 -there is actually very little that I dont like about this watch-you cant really go wrong with Michael Kors! Perhaps if you dont want to get the strap resized or dont want a watch as heavy as this one, it might not be suitable. This watch is absolutely perfect for me. It not only provides the impeccable style you would expect from Michael Kors but very functional, with many features for everyday use. I was a it conscious about wearing it for everyday use as it is so expensive, but it is everything I could have asked for in a watch aesthetically and practically. If you want to wear it for special occasions, it is a beautiful jewel piece which Im sure will look great with any outfit. It looks better in real life than in any picture Ive seen. 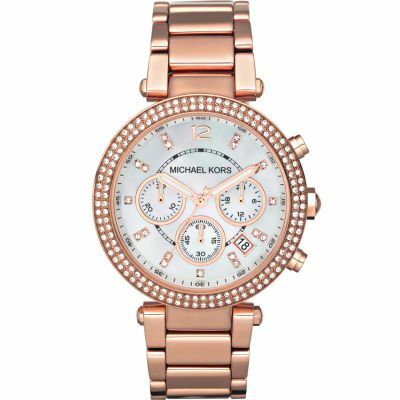 If you are looking for a high-end watch, you cant go wrong with Michael Kors designs and this design encaptures everything about Michael Kors-the glamour, class and style along with the surprising functionality! Initially very impressed with the site, the price and the ability to order a strap adjustment. I wanted to check the delivery address to ensure that the watch was sent to my office rather than my home. The order was put on hold while this question was answered but unfortunately the hold was not reversed. Despite numerous emails and phone calls I could not find out the expected arrival of the watch and it did not arrive in time for my daughters 16th Birthday. Eventually this was resolved and I received the watch the next day. she is over the moon with it. MIxed feelings but Id recommend you to friends and family but recommend a better customer experience through updated email communications. Product was exactly as shown in the picture. However, more zooming features could clarify the concerns. Fantastic watch, bought as a gift for partner, she totally loves it. Looks fantastic with the champagne background and the diomante finish around the clock face also the diomante numbers are a personal treasure. The weight feels fantastic on the wrist not light enough tonlose and also not heavy enough to weigh her arm down. ACTUALLY IS WATER PROOF!!! 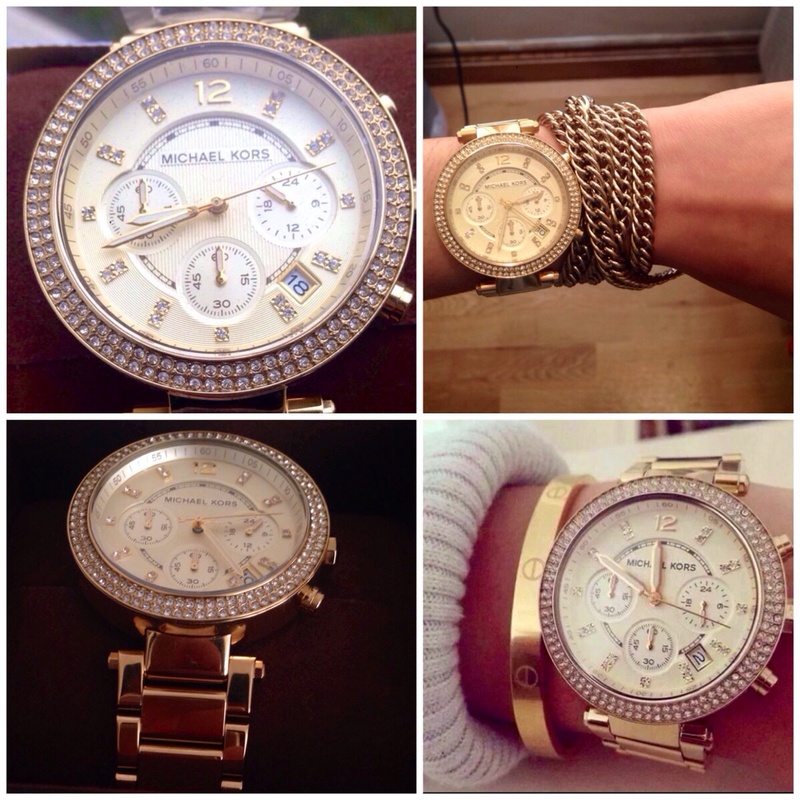 All in all a completely stunning watch and would look fantastic on any lady! Absolutely love my watch!! I looked at quite a few before finally deciding to buy this one. 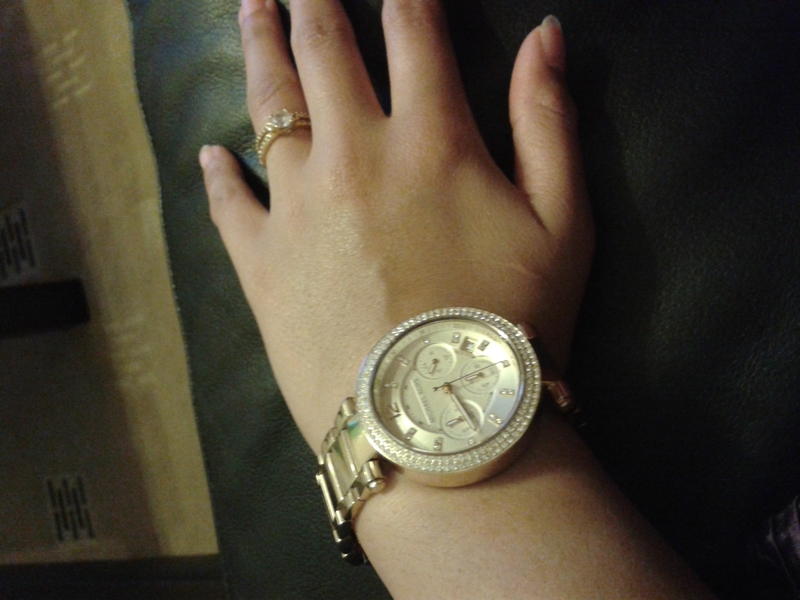 The watch is very pretty on the face is a good size and even though I have small wrists it doesnt look oversized. The watch itself is very good quality and feels heavy, in a good way! Its dressy enough to wear on a night out but not over dressy so can still be worn day to day. I had it resized by watch shop so it fits me perfectly, and even though the resized it I received it the day after I purchased it... Super fast delivery! Would defiantly recommend And this was the cheapest price online and in stores, £50 cheaper then everywhere else! If you want a classy watch that can be used day to day and on evenings out go for it!! Not worn yet as christmas present but fantastic looking watch exactly what I was looking for. Very efficient delivery service and lovely watch. She is going to be very pleased on Christmas day. 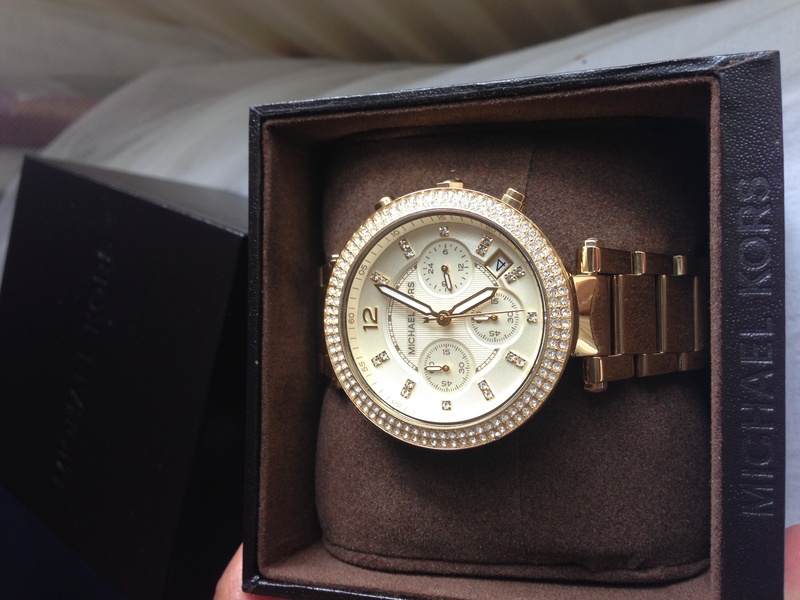 Im thinking I might get her another one now because its her birthday in January - Ill be using the watchshop again. Product arrived very swiftly, great service all round. I hope she likes it for Christmas. Really pleased with the Michael Kors watch i purchased for my daughters christmas present. We had a few links removed and its a lovely fit with a nice big clear face that looks really pretty with the diamonte surround and digits. Beautiful watch. It looks better than the pictures on the website. The watch has weight to it, definitely a show stopper! I would recommend buying this watch. This beautiful watch was worth every penny and made the most perfect gift for my 17 year old daughter, who had wanted it for quite some time. Its beautifully sparkling face looks gorgeous on her wrist, and I cant fault it at all! O have this watch in two colours and I love them. Both fit lovely and thes styles different and matches loads of different things. The product is beautiful and elegant. The size is tasteful and bold without being presumptuous. 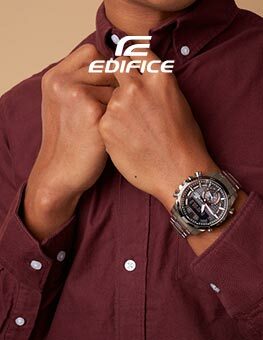 The inclusion of dials within the face of the watch is a great adds to the overall statement of the watch. For the last year, I bought it for her sixteenth birthday as a present was the best choice and I had a very happy daughter. Very happy with my purchase the watch looks great and I receive plenty of compliments. I love that it has the date aswell. Its a really classy expensive looking watch and it feels it too. Sparkly and gorgeous. A really well made timepiece at a good price. Couldnt be happier with my choice. I just got this watch this morning and I love it already! I had to get 4 links taken out which was not an issue. The face of the watch is pretty big, which will take some getting used to, but it still looks lovely and feminine. I had never seen myself wearing gold, as I usually wear silver but I absolutely love it in gold as its so eye catching! I like that the little stones replace numbers 1 through 11. 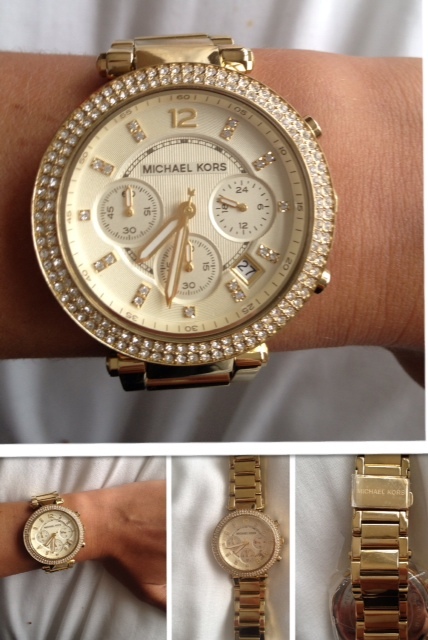 If your looking for a watch thats a bit of a statement whilst still being feminine this is the one to go for! I could not be happier with my purchase! Amazing product, Ill defiantly will be buying a products from Michael kors again. And defo buying from watch shop again, super quick delivery! This is a short but sweet review. The Watch is fab. Best thing ive invested in in a long time. Its beautiful, elegant and certainly an eye catcher. I have very small wrists but its perfect, not overly big. However watchshops servicr is disgusting i truely hate them. I got a partial refund for a previous watch i bought. It was delivered scratched and even other people commented on it. I got deducted £25 from my refund so i am fuming and frankly livid with their service. They are clever the way they go about their terms and conditions but its to defraud most of u. Anyway hope you found this helpful, especially you watchshop. Cheers init. P.s excellent watch, disgusting customer service. Bought for my girlfriends birthday, is a top quality watch and looks just as good in real life as it does in the picture. Looks a lot more than its price tag and would highly recommend to anyone looking to buy a reasonably priced designer watch. GREAT BUY! The product was okay but I had to get it altered and paid £8 for it. It did look a little different to how I saw it on the image as on the image it looked more gold whereas when I received it looked a little washed out. I was thinking of sending it back but my friends persuaded me to keep it plus I couldnt be asked to go through the whole sending back process. I bought this watch for myself. I wasnt sure at first if I should get it or not, but as soon as I received the watch I loved it! no regrets at all, the diamantes give it a nice touch. This is a brilliant product, arrived quickly and was exactly as described. i am very happy with the service. Exactly what I was after, in perfect condition and looked exactly as pictured. Face is larger than anticipated, however this is not an issue. Love this product, and hopefully the Mrs will too! Watch is great. Was abit skeptical at first about buying this watch on here but im pleased with the watch i received today. Looks fab, asked for it to get fitted but was still big. Had to take it to a watch store and payed £5 to get the watch the right size. This watch looks great, very classy. Just wished the diamonds on bezel were more shinier like the ones inside the bezel, the outside ones are abit dull. 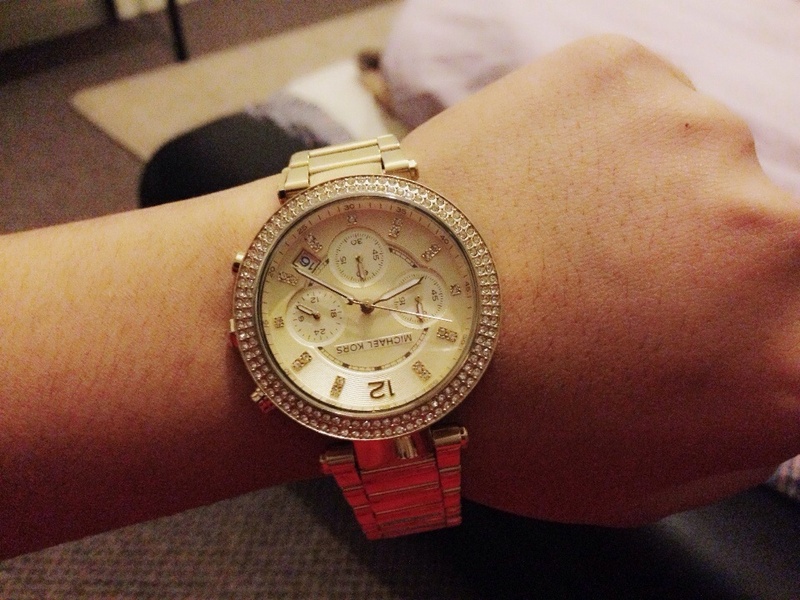 Overall im happy with the purchase, gorgeous watch which i definitely recommend! What a head turner this watch is. The detail on the watch is magnificent, you could literally look at it for an hour in amazement. The gold is the perfect tone, and the set stones really finish it off. A number of Michael Kors watch faces can be a little too big, some a litle too small, but this is the perfect medium and is not too heavy, although heavy enough to know you have it on. The date function is in the perfect location. Even down to the detail on the hands, this watch is dazzling. Loved the watch! - it is so elegant but at the same time modern exactly what I needed. 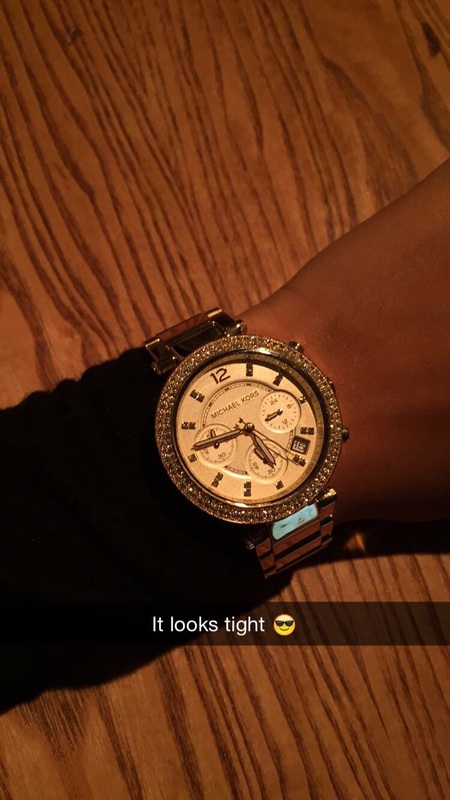 The watch face itself is large but because of the rhinestones around the face it makes it very girly and pretty. The watch is much nicer face to face & the colour of gold is much more shinier. I love how I can wear it for any occasion. Very happy. This watch was bought for me as a present for my graduation. 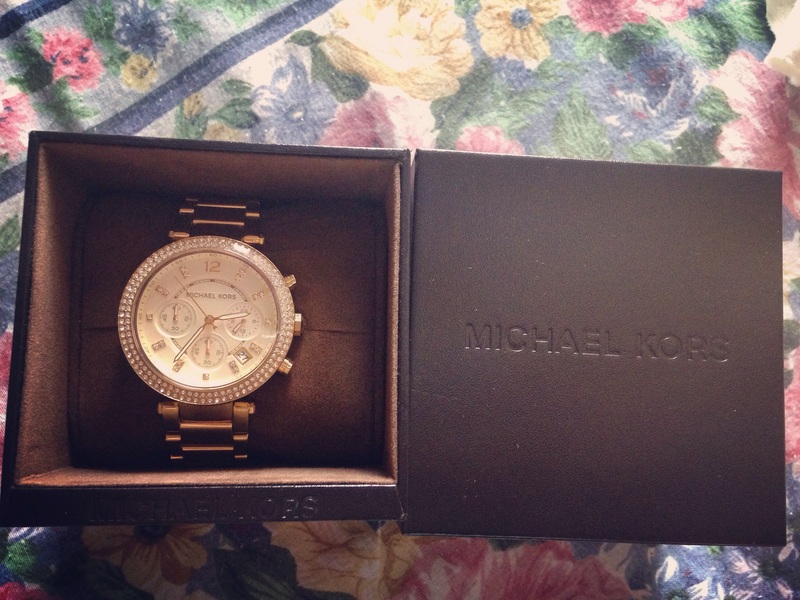 The watch comes in a beautiful brown leather Michael Kors box. The watch itself is extremely feminine and not as bulky as some of the other styles - which was great for me as I have quite small wrists. The watch face is champagne colour and is surrounded with stunning crystals both inside the watch replacing the numbers 1-11 and also two rows surrounding its face. The crystals shine in the sun which makes it extremely eye catching and really draws attention to the watch. I have received many compliments regarding this watch and it is easy to wear for any occasion. 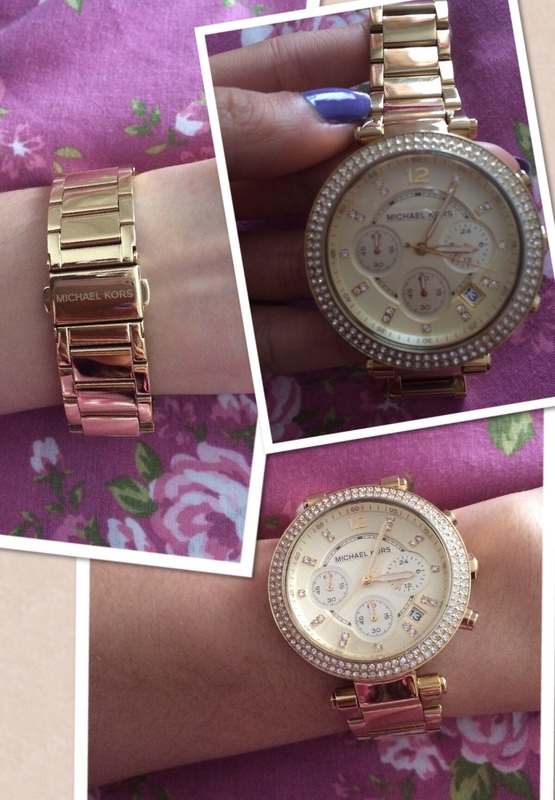 Also on the clasp Michael Kors is engraved which shows on the reverse of your wrist. At the back side of the watch face there is probably only a small amount of space to be engraved - if this is an option that you are considering. The strap in thinner than what I expected which again, I think is an element that makes the watch more feminine and due to its overall light weight makes it easy to wear for long periods as it is very comfortable. I did have to pay to get 3 links removed as it was really big when I received it - this only cost £3. I think most people would need to do the same. I would definitely recommend this watch, as it really is stunning and does stand out from the others. If you are thinking about buying it - go for it you will love it!! This is a stunning watch. At first I was rather reluctant to go for a MK watch because everyone has one- but now I see why they are timeless, big but feminine and modern but have something classy and classic about them. I have small small wrists but this looks beautiful and not too big. Originally I had bought a Guess watch which I returned because it was HUGE so I went with this and have no regrets...it even looks better in real life!!! The diamontes on the dial are classy and stuck firmly...the colour is bright and the watch goes well with my smart outfits for work but also for my casual outfits for Uni. Just splendid! I love this watch! Its just perfect and stylish. I love the diamonds around the watch and the dial is very feminine because its a champainge colour and has diamonds inside the dial too which is shiny and sparkles. As the watch is stainless steel it wont scratch and well worth its price. Also because it is gold plated looks extremely expensive and the gold colour would never fade and look dull. The size was abit big but got the links taken out, now fits perfectly. 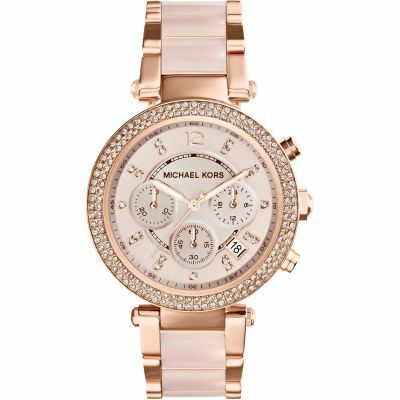 Goes with everything you wear and you cant go wrong with Michael Kors!! very classy watch. much admired by all friends. looks more expensive than it was. Lovely timepiece - it is what my daughter really wants - looks fantastic on and is exactly what she expected. The colour and syle are magnificent - and she loves her bling. What a lovely watch did not disappoint perfect for my daughter for Christmas, no doubt where we were going to order from as I purchased a watch for my husbands birthday delivered next day so again ordered this watch early evening arrived next day before 10am perfect in every way from ease of order to fast delivery will be back again thanks again. 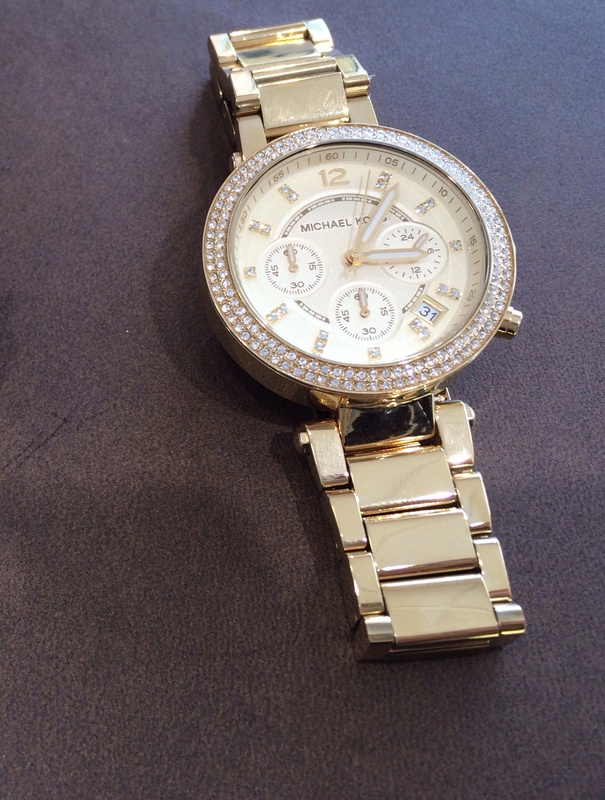 Watch Shop is een geautoriseerde Michael Kors verkoper.